Diamond Details: 551 Naturally heat treated green diamonds weighing 4.22 carats total and 263 naturally heat treated orange diamonds of F color, VS2 clarity, and of excellent cut and brilliance, weighing 1.16 carats total. Metal Details: 18k white Gold with black rhodium. Measurements: 4 Inches in length and 26mm at the widest point. 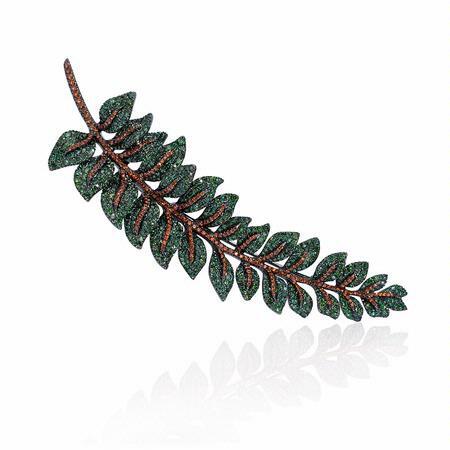 This lovely 18k white gold brooch pin, contains 551 naturally heat treated green diamonds weighing 4.22 carats total and 263 naturally heat treated orange diamonds, of F color, and VS2 clarity, weighing 1.16 carats total. The brooch measures 4 inches in length and 26m at the widest point.